The 14th Amendment is about Citizenship Rights. It is also called the Citizenship Clause or the Liberty Clause. Both the 5th & 14th Amendments contain a Due Process Clause. Summary: The 14th Amendment was ratified in 1868, during the administration of Andrew Johnson, stating that every person born in the US is a citizen. States must follow due process of law before taking away any citizen's rights or property. The 14th amendment was passed by Congress on June 13, 1866 and ratified on July 9, 1868. 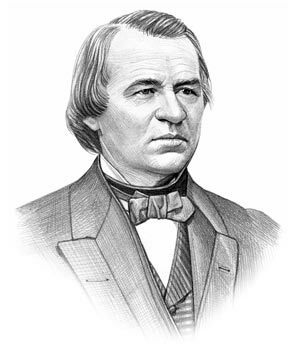 Andrew Johnson was the 17th President of the United States whose presidency spanned from April 15, 1865 to March 4, 1869. One of the key events during his presidency was the ratification of the 14th Amendment to the Constitution. The cause or reason for this addition to the Constitution was to assert that there were equal protection rights of all US citizens including those that were part of a minority group. The 14th amendment nullified part of the Dred Scott decision. The concept and implementation of this addition has formed the basis for all modern civil rights laws, disability acts and other actions designed to protect the rights of minority groups. Both the 5th Amendment and the 14th Amendment contain a Due Process Clause. 'Due process' deals with the administration of justice and the Due Process Clauses act as safeguards from arbitrary denial of life, liberty or property by the Government, outside the authorization of law. Section 4 of the 14th amendment refers to public debt and confirmed the legitimacy of all public debt appropriated by the Congress. The purpose of this amendment was to address the concerns that, once fully readmitted to the Union, senators and representatives from Southern states would deliberately refuse to repay debts that were incurred in the insurrection during the confederate rebellion. Section 4 of the 14th amendment also states that the US will not pay any claim for the freeing of any slave and that all debts of this kind are invalid and illegal - refer to 13th Amendment in which slavery was abolished. The meaning of the words and phrases in the 14th Amendment of the Constitution are about Citizenship Rights and explained as follows: Note: Article I, section 2, of the Constitution was modified by section 2 of the 14th amendment. The 14th Amendment was the first time in which an Amendment added the word "male" into the US Constitution. The wording caused outrage in the Women's Suffrage Movement. The Amendment 14, section 2, of the Constitution was modified by section 1 of the 26th amendment. "All persons born or naturalized in the United States, and subject to the jurisdiction thereof, are citizens of the United States and of the State wherein they reside. No State shall make or enforce any law which shall abridge the privileges or immunities of citizens of the United States; nor shall any State deprive any person of life, liberty, or property, without due process of law; nor deny to any person within its jurisdiction the equal protection of the laws...."
All people who are born or naturalized (accepted) in the US and who are not citizens of another country are citizens of the US and of the state they live in. States may not make, or enforce, any laws which limit or reduce the privileges and rights of US citizens. States may not take a person’s life, liberty, or property without going through the DUE PROCESS (steps) required by law. "Representatives shall be apportioned among the several States according to their respective numbers, counting the whole number of persons in each State, excluding Indians not taxed. But when the right to vote at any election for the choice of electors for President and Vice-President of the United States, Representatives in Congress, the Executive and Judicial officers of a State, or the members of the Legislature thereof, is denied to any of the male inhabitants of such State, being twenty-one years of age, and citizens of the United States, or in any way abridged, except for participation in rebellion, or other crime, the basis of representation therein shall be reduced in the proportion which the number of such male citizens shall bear to the whole number of male citizens twenty-one years of age in such State." The number of representatives for each state has depends on the number of people in that state. The whole number of people to be counted in the census to determine how many representatives a state shall send to Congress. The number does not include Native American Indians who are not taxed. If a state has limits on men aged 21 or older who can vote for electors for president, vice president, representatives, governor, and judges, then that state shall have fewer representatives in Congress. Certain people shall lose the right to vote for electors for president or vice president and also lose the right to hold the office of senator or representative or any US office if they have been involved in rebellion against the nation. "The validity of the public debt of the United States, authorized by law, including debts incurred for payment of pensions and bounties for services in suppressing insurrection or rebellion, shall not be questioned. But neither the United States nor any State shall assume or pay any debt or obligation incurred in aid of insurrection or rebellion against the United States, or any claim for the loss or emancipation of any slave; but all such debts, obligations and claims shall be held illegal and void." The United States will pay all of its debts that were authorized by law. This will include promises to pay pensions and rewards for people who joined the army to fight against the rebellion (the army of the Confederacy). The US will not pay any claim for the freeing of any slave. All debts of this kind are invalid and illegal. "The Congress shall have the power to enforce, by appropriate legislation, the provisions of this article." The original full text of the 14th Amendment of the Constitution is as follows. Note: Article I, section 2, of the Constitution was modified by the 14th amendment. Representatives shall be apportioned among the several States according to their respective numbers, counting the whole number of persons in each State, excluding Indians not taxed. But when the right to vote at any election for the choice of electors for President and Vice-President of the United States, Representatives in Congress, the Executive and Judicial officers of a State, or the members of the Legislature thereof, is denied to any of the male inhabitants of such State, being twenty-one years of age,*** and citizens of the United States, or in any way abridged, except for participation in rebellion, or other crime, the basis of representation therein shall be reduced in the proportion which the number of such male citizens shall bear to the whole number of male citizens twenty-one years of age in such State. *** Changed by section 1 of the 26th amendment. The above information provides the text, definition and summary of the amendment. The following Andrew Johnson video will give you additional important facts and dates about both the personal life and political life of the 17th President of the United States whose presidency spanned from April 15, 1865 to March 4, 1869.